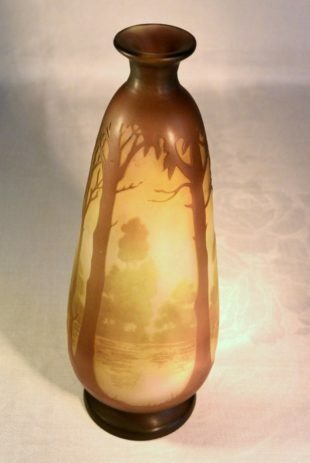 Émile Gallé (1846-1904) was the French glass designer who developed new forms of glass and new techniques for making glass as a reaction on the not inspiring style of the end of the 19th century, the so-called neo-styles or “historism”. Colorless crystal glass, with hand painted decoration (enamel-painting). 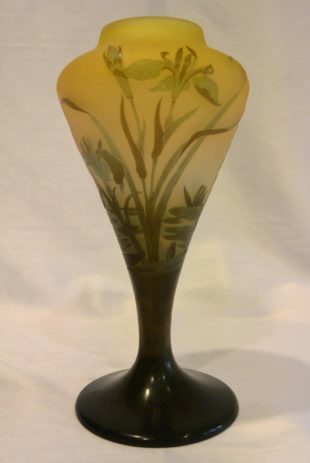 Opalescent glass with hand painted decoration. The so-called “marquetterie de verre”: inlay work of glass-in-glass. The etching technique: working with different layers of glass over each other and by etching a layer away, you can get the decoration of a flower or a landscape. Mostly it’s used for the decoration of a template/stencil. 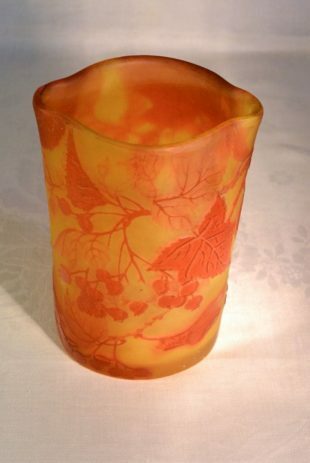 Very precious pieces are vases which have been executed not only with the technique as decribed above, but also with the laying of an “appliqué”, an extra piece of hot glass on the surface of the glass of the oven, which was graved with the wheel afterwards. Gallé died in 1904 on leukemia and afterwards the factory was managed by his wife Henriette Gallé and his son in law Paul Perdrizet until 1938. The vases of 1904 to 1906 are marked with a star as a remembering to Emile Gallé. 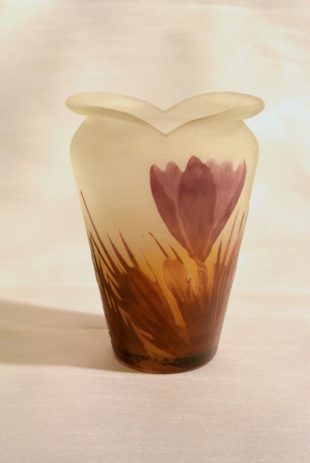 The later vases from 1920 until 1938 are very precious nowadays, because the technique of etching and pressing the glass was of a very high quality. There was another part of the factory Gallé that developed and executed furniture. The designs were untill 1904 from Gallé himself and from 1890 clearly inspired by nature: flowers, dragonflies, plants, and landscapes. You can recognize in the representation of the furniture some influence of the Japanese art of drawing, special with the ‘marquetterie’ of the white water lilies. Also his signature on the tables seems to be Japanese. The greater part of Gallé’s production existed of ‘tables cigognes’, small tables that one could shift under each other. The other part of the furniture exists of not too big executed pieces: tables for the tea, pedestals, tablets for the tea and so on. The furniture is light of weight, clear of color, and with fantasy forms of the legs of the tables. They were a very clear reaction on the heavy and dark and sometimes black furniture of the end of the 19th century. Alistair Duncan, Galle Furniture, the Antique Collectors Club, 2012.